An open letter from the “other side of the bedrails” from a nurse and Service Executive at Methodist Hospital. In March, my family had the unfortunate opportunity to experience what was like to be on the “other side of the bedrails” when my mom came in for tongue cancer surgery. I saw a whole new perspective of what it was like to have someone who had a major head and neck procedure and couldn’t talk, couldn’t open their mouth, couldn’t function as a healthy normal person would. Things that I knew were happening, and had to happen, now made no sense to me. What was described as a “normal post op recovery” seemed anything but normal. Mom experienced sleep deprivation from hourly checks, alarms, diarrhea from tube feedings and restless legs, requiring her to get out of bed, no matter what time of the day it was. The staff was patient as mom wrote her notes or tried to mouth words (these nurses are awesome at reading lips!). Mom wanted to nominate the entire floor for all of their excellent care! I asked her if anyone stood out in particular for their care and she mentioned both Jason Heimes and Marie Christensen, as nurses that had touched her in a unique way by their compassion and genuinely caring ways. They were always quick to answer her light and follow up with even the smallest of requests. They showed patience with mom when she couldn’t communicate and understood when she needed to get up out of bed in the middle of the night for her restless legs. (Marie and Jason) showed patience with mom when she couldn’t communicate and understood when she needed to get up out of bed in the middle of the night for her restless legs. Mom was an LPN earlier in life and it was clear that Marie and Jason spoke with her with the respect of a nurse, yet cared for her as a patient. They took time to explain, to listen and to encourage mom during the week she was there. Mom felt they were called to this profession because of the special gifts of compassion and kindness that can’t be taught, but comes naturally from within. At times mom would ask me if the nurses were that nice because “I am the boss” and I told mom no, that these nurses truly were the meaning of care with everyone! Mom felt they were called to this profession because of the special gifts of compassion and kindness that can’t be taught, but comes naturally from within. I had to put my nurse hat away and be a daughter and trust that the nurses were going to take care of my mom. I would read some of the notes that mom had written while trying to communicate and it was clear that she truly trusted the nurses and that I had nothing to fear when I left for the day. There is no better feeling than knowing your loved one is left in safe, caring hands. So my family and I, send a HUGE thank you to Marie and Jason for all of your support and caring during one of the longest and hardest times of our lives. We are honored to nominate you for the Daisy award as a small token of appreciate for what you not only did for us, but for all of your patients! Jason Heimes, Marie Christensen and the entire Progressive Care Unit were recognized with the DAISY award for nursing excellence. 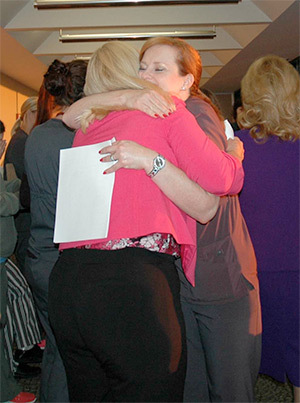 The DAISY award is a national program recognizing excellence in nursing care.